A new Jollibee party theme is in the works and it will be unveiled on the first day of June 2015. This Jollibee party theme is the Fun-tastic Factory. The announcement of the new party theme is posted on the Jollibee party website but no other details were provided. We can be sure, however, that the Fun-tastic Factory Jollibee party theme will be filled with exciting giveaways and other surprises that the kids will surely love. Jollibee currently has the following party themes: Hello Kitty party theme, My Best Friend Jollibee party theme, and Jollitown party theme. 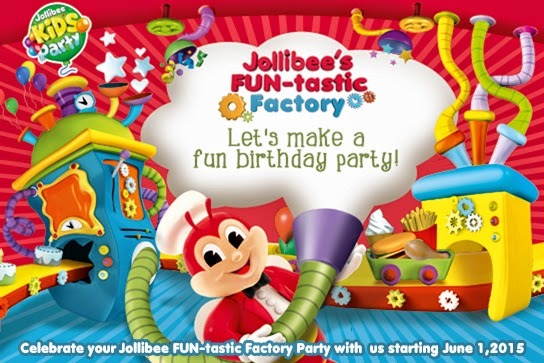 The Fun-tastic Factory party theme will replace the My Best Friend Jollibee party theme. Those who will book their party on and after June 1 can now choose the Fun-tastic Factory party theme for their Jollibee party. You can also choose other Jollibee party themes like Hello Kitty party theme and the Jollitown party theme on that date. Read my post, How to Plan Your Jollibee Party, to know how to book or plan your Jollibee party using the Jollibee party website. LEAVE A COMMENT below or send me a private message through my Contact Me page for your questions about Jollibee party.